It is the case that gave rise to the attacks on “frivolous lawsuits” in the United States. Almost everyone seems to know about it. And there’s a good chance everything you know about it is wrong. Typical reaction: Isn’t coffee supposed to be hot? 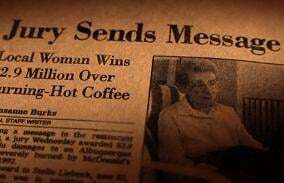 And McDonald’s didn’t pour the coffee on her, she spilled it on herself! Besides, she was driving the car and wasn’t paying attention. Mrs. Liebeck offered to settle the case for $20,000 to cover her medical expenses and lost income. But McDonald’s never offered more than $800, so the case went to trial. The jury found Mrs. Liebeck to be partially at fault for her injuries, reducing the compensation for her injuries accordingly. But the jury’s punitive damages award made headlines — upset by McDonald’s unwillingness to correct a policy despite hundreds of people suffering injuries, they awarded Liebeck the equivalent of two days’ worth of revenue from coffee sales for the restaurant chain. That wasn’t, however, the end of it. The original punitive damage award was ultimately reduced by more than 80 percent by the judge. And, to avoid what likely would have been years of appeals, Mrs. Liebeck and McDonald’s later reached a confidential settlement. That’s because those jurors were able to hear all the facts — including those presented by McDonald’s — and see the extent of Mrs. Liebeck’s injuries. Ask anyone who criticizes the case as a “frivolous lawsuit” that resulted in “jackpot justice” if they have done the same. How would YOU decide the McDonald's Hot Coffee case?